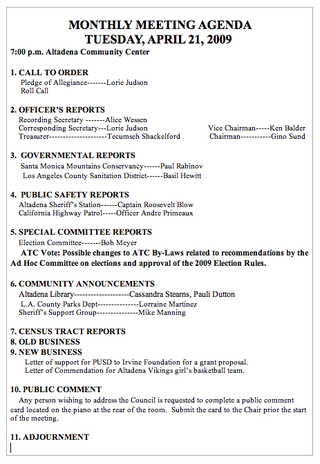 Altadena town council meeting Tues.
at the community center, 730 E. Altadena Dr., 7 PM. UPDATE 4/20: Agenda is up, after the jump, click to enlarge. Major item: Possible changes to ATC By-Laws related to recommendations by the Ad Hoc Committee on elections and approval of the 2009 Election Rules.